When I first saw that Wim Wenders’ 1987 film Wings of Desire was to be adapted into a play by the Compagnie Oui Aujourd’hui, I was very eager to see how a script that is so linked to the possibilities of cinema was going to be transposed onto the stage. Walking out of the Théâtre 13, I felt my high expectations had not been met and I had the urge to watch the film again to remember its poetry and delicateness which, unfortunately, were not replicated in Marie Ballet’s directing. Wenders’ movie is an absolute favourite of mine, it was difficult to let go of all its subtle images and words that haunt me every day since I discovered it. Wings of Desire tells the story of two angels, Cassiel and Damiel, who observe the everyday life of Berliners and hear all their thoughts. Damiel falls in love with Marion, a French trapeze artist who works in a circus, and, pushed by his burning desire to see colours, to feel, to smell, to taste… well, to live, he chooses to become a physical being. What makes the film aesthetically very special is the use of both monochrome and colour, the first to translate the angels’ point of view and the latter corresponding to the physical human beings. The use of colour was also obvious in the play, in a simple but efficient way: the two angels were dressed in dark, dull colours that made them fade into the set while the others wore bright and shiny clothes. The first thing that struck me was that the text, translated in French, loses a great deal of its peculiar musicality that comes from the German language. The way the actors talked and moved, brutally and sometimes almost aggressively, reinforced the fact that the original text, which is delicate and full of poetry, was emptied of its lyrical and aesthetic beauty. The character of the musician (Stéphane Léchit), who replaces the one of Peter Falk in the film, could have been interesting if he had not overacted and if his songs had actually made sense. As a result, the story is the same, but the emotions vanished. However, the show brings something interesting to the text and draws an ambiguity where the film didn’t. When the character of Marion (Camille Voitellier) talks, it is difficult to know if we and Damiel (Christophe Laparra) only are hearing her thoughts or if the other non-angel characters are also hearing them. This, added to the stripped-down, all-black set design, creates an impression of intense loneliness, almost as if the stage represented the interiority of the character. I cannot pretend the parts when Marion was on the trapeze were not striking: they felt out of time and the shadow play produced by the lights highly contributed to this dream-like atmosphere. The minimalist set design which works in that way also has its drawbacks, especially when the angels talk about the divided city of Berlin and the destroyed Potsdamer Platz. The city is so important in the script (the original title Der Himmel über Berlin proves my point), and its absence makes some parts of the play strange, but this is due to the limits of the theatrical representation, not from this play in particular. I had very high expectations for the last scenes, and the way Marion and Damiel’s encounter was going to be directed and acted. Having Bruno Ganz and Solveig Dommartin’s wonderful and delicate dialogue in mind, I was certainly not expecting to hear the actors shout and move about without seeming to look at each other. The only thing that could make this scene a little moving was, ethereal and dimly lit, the character of Cassiel (Paul Nguyen), watching the couple from the back of the stage, flying above the ground. Although Cassiel is a secondary character, he is the only one whose acting was subtle enough to create emotions and let the spectators leave the theatre with a dazed smile on their faces. 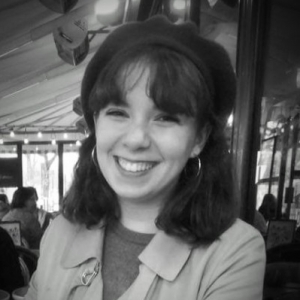 After obtaining a Film Studies degree at La Sorbonne Nouvelle, Emilie is now studying French literature in the same university. As a photographer and film director, she is particularly interested in the links between images and living performance.